Background: Sickle cell disease (SCD) is prevalent in Basrah city and affects the red blood cell (RBC) deformability and thereby causes disease symptoms. Hydroxyurea (HU) is effective in reducing morbidity and mortality in SCD patients by different mechanisms. 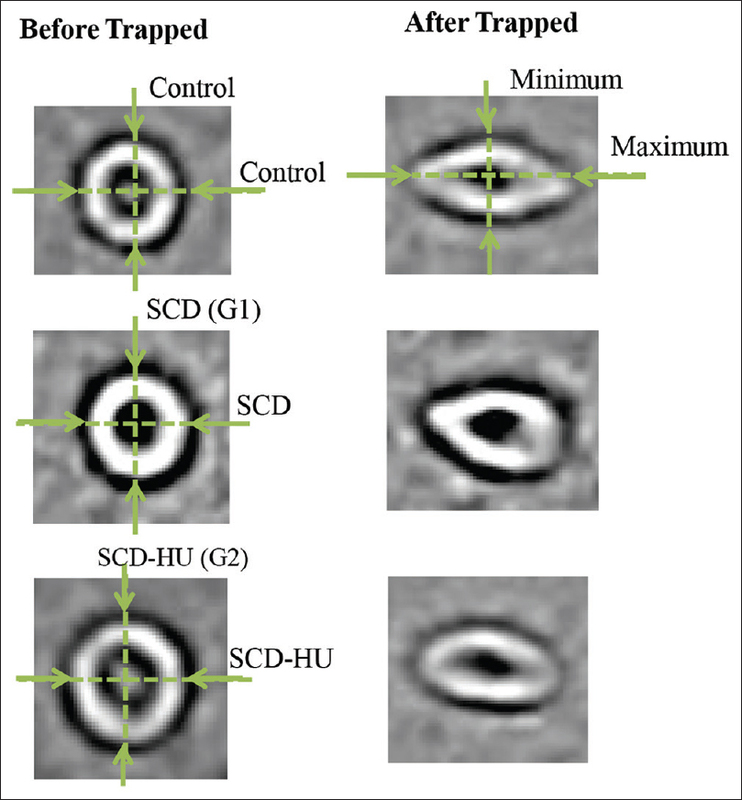 Objectives: The aim of the study was to investigate the effect of HU on RBC deformability among SCD patients by direct laser optical trapping (OT) technique. Materials and Methods: Blood samples from SCD patients and control groups were prepared in the medical laboratory of Basrah Center for Hereditary Blood Diseases and transferred into physics laboratory wherein the laser system was presented and built-in. RBCs from each sample were exposed to three different powers of laser 5, 15, and 20 mW for 15 s and then were released and followed for 2 min. The images for each trapped RBC were obtained and at relaxation sequential times. The percentage changes in the diameters of trapped RBCs were measured for control and patient groups. Results: SCD patients were divided into two groups depending on whether they were receiving HU (39 patients) or not (43 patients). They were matched with 50 healthy individuals (control) regarding age and gender. We found that all the trapped RBCs were affected during the trapping time and then returned toward near normal with some differences between the groups and according to the power used. The deformability of HU group was better and closure to the control. Conclusion: The presented laser system and OT technique with optimal power are effective to study the RBC characteristics and deformability. HU is effective in improving RBC deformability among SCD patients. The blood rheologic and hemodynamic properties are largely determined by red blood cells (RBCs) which is the main cellular component of the blood. The normal healthy RBCs are biconcave disc shape with approximately 7.5–8.7 μm in diameter and 1.7–2.2 in thickness, and were not subjected to an external stress. Such healthy RBCs have a flexible membrane that facilitates reversible elastic deformability during RBC passage through the microcirculation. Some pathologic conditions affected the RBC deformability and therefore altered the circulation causing disease symptoms ranging from benign to lethal complications such as what happened in sickle cell disease (SCD). Hence, the mechanically fragile, less deformable RBCs in SCD cause hemolysis and impaired blood flow velocity contributing to other pathophysiologic aspects of disease.,, The impaired blood flow plays a major and key role in acute and chronic complications of SCD. In Basrah, we have studied the clinical and hematologic effects of HU, but yet, there is no research about the RBC deformability. We hypothesized that studying RBC deformability may help to understand more aspects of HU effect on RBCs. Therefore, we have presented and built a single-laser OT technique to study the therapeutic effect of HU on deformability of a single-living RBC obtained from blood samples of SCD and healthy control participants in a comparative study. The study was conducted between November 2016 and August 2017 in two institutes: Basrah Center for Hereditary Blood Diseases and the Department of Physics, College of Science. The study was approved by ethical committee of college of science university of Basrah. written inform consent was obtained from each patient prior to study. The adult patients with SCD who were taking HU regularly for 3 months were included in this study to compare with SCD patients without HU. We have excluded patients with interrupted use of HU and those with severe painful crises. Blood samples from the patients and control healthy individuals were collected and prepared in the medical laboratory and then transferred within 3 h to the Department of Physics' laboratory. For sample preparation, the blood was taken from patients and healthy controls and collected in ethylenediaminetetraacetic acid tube (4.5 mg/ml3). Then, 30 μl of blood was washed three times by normal saline and centrifuged at 4000 rpm for a minute. The washed RBCs were then resuspended in 1 ml of normal saline. After that, two drops of bovine serum albumin is then added to prevent RBC adhesion to glass plates. On measurement, the diluted blood samples with normal saline of 1 ml were placed as sandwich between microscope slide and coverslip. Finally, piece of coverslip was attached in three edges with colorless nail polish or Dibutylphthalate polystyreue xylene (DPX). Thus, when a Gaussian laser beam in the TEM00 mode is highly focused by an objective lens (100XOL) to a single spot in a near particle (in our case RBC) plane, the spot creates an “OT” where the particle or RBC with higher refractive index than that of the ambient medium as well as the gradient force will push toward the focus of laser beam where the intensity is highest as shown in [Figure 1]b. The technique is illustrated in [Figure 2]. A diode-pumped solid-state laser with a maximum power of 300 mW operating in a Gaussian TEM00 mode at a wavelength of 532 nm is used for trapping. The output power of the laser is attenuated by a neutral density filter and the beam is passed through a dichroic mirror (DM). Then, the beam is passed through an objective lens (100XOL) and illuminated the prepared RBC sample. DM was fixed at an angle of 45° and used to guide the laser beam through the objective and allows the reflected light from the sample. The reflected laser beam aligned and passed into the back of the objective lens. The sample was placed on an adjustable three-dimensional translation stage to accommodate the microscope slide. A halogen lamp was used to illuminate the prepared RBC sample through an objective lens (10XOL). All the samples from the controls and patients were then studied using increasing powers of laser beam during trapping starting from 5, through 15, and 20 mW. The duration of trapping was 15 s followed by relaxation periods up to 5 min. The image of the trapped cell was recorded by a charge-coupled device camera and monitored by a personal computer. Images for each trapped RBC were taken and then during the relaxation periods to compare with the images at free time. General characteristics of the healthy controls and patients are shown in [Table 1]. The enrolled 82 patients were divided into two groups, the first group (G1) included 43 SCD patients without HU and the second group (G2) included 39 SCD patients treated with HU. Most of the patients, i.e. 62, have sickle thalassemia. The age range was 14–61 years with mean age of 24.8 years for G1 and 28.4 years for G2. They were matched regarding age and gender to control group of 50 healthy individuals, P = 0.212. The RBCs from control and both patients' groups showed changes in size and shape to direct laser trapping by elongation (increase diameter) and then after release at relaxation by decreasing their diameter backward to near original size and shape but to a different extent according to the power of the laser beam and the type of the sample whether from control or from the patients' groups. As an example for the changes, [Figure 3] shows the differences in size and shape of the RBCs from control, G1, and G2 at free time and after trapping with power of 15 mW. The deformability of RBCs was analyzed by calculating their maximum and minimum diameters and the relative changes in these diameters as a function of trapped power were studied using the above-mentioned equation. We calculated the average values of all tapped RBCs from the studied samples at each specific setting of the power. The results of changes in diameters are illustrated in [Figure 4] (a and b for maximum and minimum diameters, respectively) for the RBCs of control, G1, and G2. It is clear that the percentage changes in the diameters were proportional and dependent on the trapped power of laser beam and with reduction in maximum and increase in minimum diameters at power of 15 mW as compared to power of 5 mW. At power of 20 mW, the results were disproportionate both for maximum and for minimum diameter measurements. For maximum diameters [Figure 4]a, the higher value of relative changes refers to more deformability and that is true for control group followed by G2 and lowest value for G1. The opposite applied to relative changes of minimum diameters. These results refer to better deformability of RBCs from G2 than G1 but less than that of control group. After release, we have followed up the RBCs to study their relaxation rates by measuring the percentage changes in maximum diameters at 15-s intervals for a period of 120 s. The obtained results are given in [Figure 5], and the relative average changes in the maximum diameter were plotted as a function of time for three input powers (a, b, and c for 5, 15, and 20 mW, respectively). From this figure, it is clear that the sizes and shapes of the trapped RBCs reduced back toward near (but not as exactly as) normal free cells. The pattern of return is almost the same for control and the patients' groups at powers of 5 and 15 mW with G2 closure than G1 to control. However, the rate of relaxation of G2 was not as same as the control group and the difference increased as the power of laser increased. At a power of 20 mW, the curves of changes for G1 and G2 are almost the same and obviously differ from that of the control group. We have noticed that; at the end of 120 seconds, all the trapped cells from G1, G2 and control were not fully relaxed, i.e., the relative changes did not approach to a zero value. SCD is highly prevalent in Basrah as compared to other parts of Iraq. HU is largely used among our patients, but some of them still experience painful attacks despite the improvement in HbF and other RBC indices. Therefore, the current work was conducted to evaluate the effect of HU on the deformability of sickle cells using an OT technique that was presented and built locally. The enrolled adult patients had age ranging between 15 and 61 years, most of them having sickle thalassemia syndrome, and they were age and gender matched with control healthy individuals. The cells from all the samples were measured at free time, and we found that the average value is interestingly higher for the patients than for controls. However, all the trapped cells were elongated, but the relative changes in the maximum diameters were different according to the power setting of laser and also the type of the sample whether control or patients' groups. The higher values of relative changes of maximum diameters mean more deformability properties of RBCs. The obtained results indicated that RBCs of control group were more deformable, followed by HU group, and the lowest value was for sickle patients without HU. However, the changes were disproportionate at high power (20 mW) probably due to photodamage effect that disturbed the cell membrane properties leading to protein denaturation. The photodamage effect was different for control and the patient groups. Hence, in the current work, we could point out an optimum power for the used wavelength of 15 mW as a function of the relative changes in diameters for the RBCs. When we followed RBCs after release from OT, the photos were captured for up to 5 min during relaxation time. However, the percentage changes in maximum diameters were measured at 15-s intervals for only a period of 120 s because of frequent artifacts that happened in the samples after 2 min. We found that the trapped RBCs tend to return to their near original size and shape during relaxation time, and pattern of return was almost similar for control and the patient groups at powers of 5 and 15 mW. The better response for HU group could be attributed to the effect of HU in promoting production of HbF which actively inhibits polymerization of HbS improving morphologic and physiologic properties of RBCs. This was in accord with other studies,,,, although they were using different experimental settup for measuring RBC deformability. On the other hand, the response among HU group was not as same as that of healthy control RBCs probably because some of sickle RBCs might have irreversible changes altering membrane viscosity and deformability,, despite the laboratory response by HU in those patients and that raises the necessity to investigate other mechanisms than polymerization of HbS causing membrane stiffing and reduced RBC. 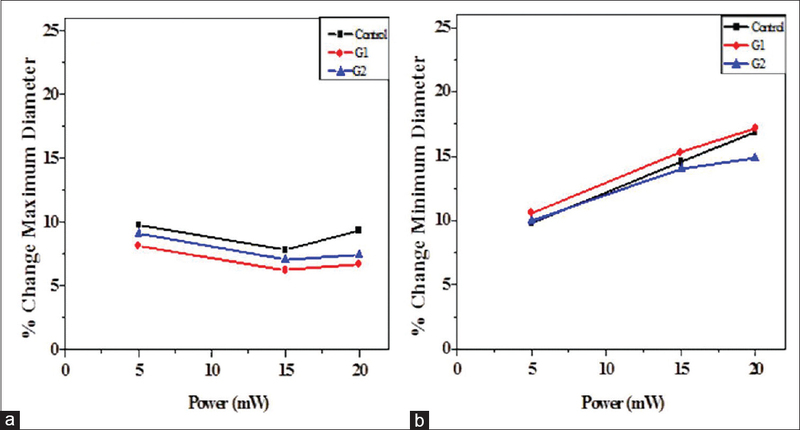 At power of 20 mW, the optical deformability for healthy control increased compared to both patient groups; this might be due to the cell photodamage affecting more sickle RBCs regardless the treatment with HU. 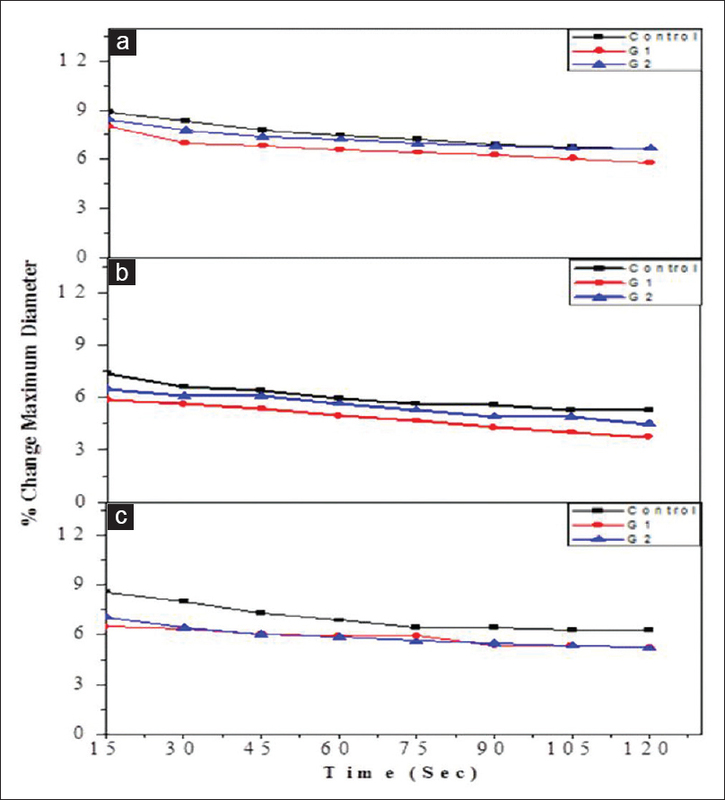 We have noticed as well that at the end of 120 seconds the trapped cells were not fully relaxed and were not returned to their exact size and shape, i.e., the relative changes did not approach to a zero value even of control sample as expected and found in other studies because we used in our experiment different sample preparation, different system setting up and different power levels. The results confirmed that the presented and built single-laser OT technique was effective and able to study the therapeutic effect of HU on deformability of a single-living RBC among patients with SCD. Although still worse than healthy control, but it was clear that the patients treated with HU exhibited better deformability properties than untreated sickle patients. The obtained results could open the way for further and future prospective studies among patients with SCD or other hematologic diseases taking into consideration other factors affecting RBC and blood properties. We are grateful to Prof. Meaad K Hassan and staff of Basrah Center for Hereditary Blood Diseases for their cooperation and help. We thank specially Dr. Sadiq Kh Ali and Prof. Omran S Habib for their support and valuable efforts. We are thankful as well to all the patients and healthy individuals who were accepting to participate in this work. Diez-Silva M, Dao M, Han J, Lim CT, Suresh S. Shape and biomechanical characteristics of human red blood cells in health and disease. MRS Bull 2010;35:382-8. Barabino GA, Platt MO, Kaul DK. Sickle cell biomechanics. Annu Rev Biomed Eng 2010;12:345-67. Chien S, Usami S, Bertles JF. Abnormal rheology of oxygenated blood in sickle cell anemia. J Clin Invest 1970;49:623-34. Usami S, Chien S, Scholtz PM, Bertles JF. Effect of deoxygenation on blood rheology in sickle cell disease. Microvasc Res 1975;9:324-34. Connes P, Alexy T, Detterich J, Romana M, Hardy-Dessources MD, Ballas SK, et al. The role of blood rheology in sickle cell disease. Blood Rev 2016;30:111-8. Piel FB, Patil AP, Howes RE, Nyangiri OA, Gething PW, Williams TN, et al. Global distribution of the sickle cell gene and geographical confirmation of the malaria hypothesis. Nat Commun 2010;1:104. Al-Timimi AH. Clinico-pathological study of sickle cell anemia in Basrah. Med J Babvlon 2004;1:18-24. Hassan MK, Taha JY, Al-Naama LM, Widad NM, Jasim SN. Frequency of haemoglobinopathies and glucose-6-phosphate dehydrogenase deficiency in Basra. East Mediterr Health J 2003;9:45-54. Ware RE. How I use hydroxyurea to treat young patients with sickle cell anemia. Blood 2010;115:5300-11. Singh H, Dulhani N, Kumar BN, Singh P, Tiwari P. Effective control of sickle cell disease with hydroxyurea therapy. Indian J Pharmacol 2010;42:32-5. Kattamis A, Lagona E, Orfanou I, Psichou F, Ladis V, Kanavakis E, et al. Clinical response and adverse events in young patients with sickle cell disease treated with hydroxyurea. Pediatr Hematol Oncol 2004;21:335-42. Hankins JS, Ware RE, Rogers ZR, Wynn LW, Lane PA, Scott JP, et al. Long-term hydroxyurea therapy for infants with sickle cell anemia: The HUSOFT extension study. Blood 2005;106:2269-75. Steinberg MH. Hydroxyurea treatment for sickle cell disease. ScientificWorldJournal 2002;2:1706-28. Neuman KC, Block SM. Optical trapping. Rev Sci Instrum 2004;75:2787-809. Svoboda K, Schmidt CF, Branton D, Block SM. Conformation and elasticity of the isolated red blood cell membrane skeleton. Biophys J 1992;63:784-93. Alasdi M, Alharon S, Khalaf A. Hematological Effects of Hydroxyurea Treatment in Patients with Sickle Cell Disease in Basrah Province/Iraq. Master's thesis, College of Medicine, University of Basrah; 11-7. Ashkin A. 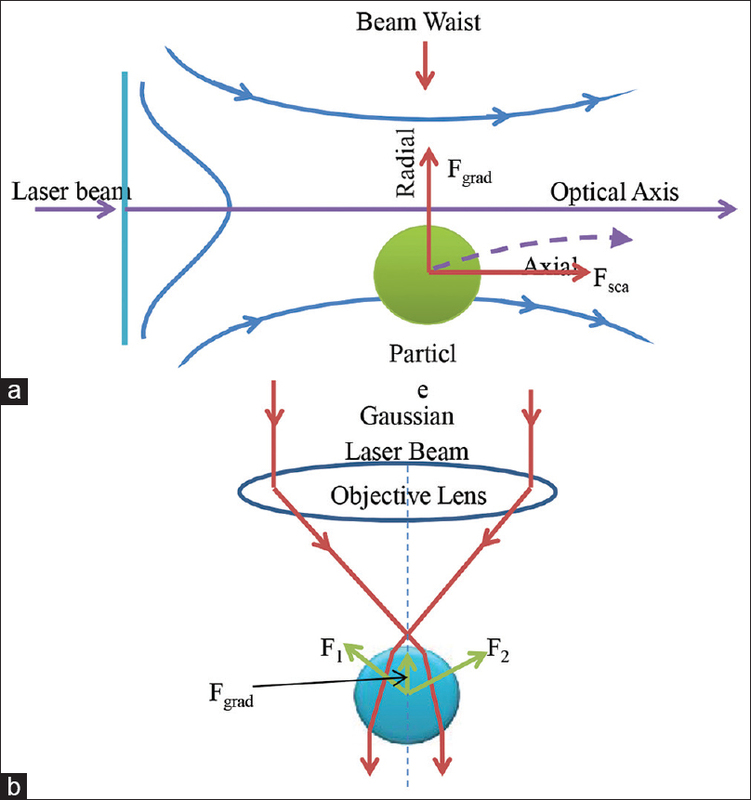 Force of a single-beam gradient laser trap on a dielectric sphere in the ray optics regime. Biophys J 1992;61:569. Ashkin A, Dziedzic JM, Bjorkholm JE, Chu S. Observation of a single beam gradient force optical trap for dielectric particles. Opt Left 1989;11:288. Ashkin A. Optical trapping and manipulation of neutral particles using lasers. Proc Natl Acad Sci U S A 1997;94:4853-60. Pellizzaro A, Welker G, Scott D, Solomon R, Cooper J, Farone A, et al. Direct laser trapping for measuring the behavior of transfused erythrocytes in a sickle cell anemia patient. Biomed Opt Express 2012;3:2190-9. Wood BR, McNaughton D. Raman excitation wavelength investigation of single red blood cell in vivo. J Raman Spectrosc 2002;33:517-23. Agrawal RK, Patel RK, Shah V, Nainiwal L, Trivedi B. Hydroxyurea in sickle cell disease: Drug review. Indian J Hematol Blood Transfus 2014;30:91-6. Renoux C, Romana M, Joly P, Ferdinand S, Faes C, Lemonne N, et al. Effect of age on blood rheology in sickle cell anaemia and sickle cell haemoglobin C disease: A cross-sectional study. PLoS One 2016;11:e0158182. Li X, Du E, Lei H, Tang YH, Dao M, Suresh S, et al. Patient-specific blood rheology in sickle-cell anaemia. Interface Focus 2016;6:20150065. Brandão MM, Fontes A, Barjas-Castro ML, Barbosa LC, Costa FF, Cesar CL, et al. Optical tweezers for measuring red blood cell elasticity: Application to the study of drug response in sickle cell disease. Eur J Haematol 2003;70:207-11. Athanassiou G, Moutzouri A, Kourakli A, Zoumbos N. Effect of hydroxyurea on the deformability of the red blood cell membrane in patients with sickle cell anemia. Clin Hemorheol Microcirc 2006;35:291-5. Nash GB, Johnson CS, Meiselman HJ. Mechanical properties of oxygenated red blood cells in sickle cell (HbSS) disease. Blood 1984;63:73-82. Clark MR, Mohandas N, Shohet SB. Deformability of oxygenated irreversibly sickled cells. J Clin Invest 1980;65:189-96. Jung J, Matemba LE, Lee K, Kazyoba PE, Yoon J, Massaga JJ, et al. 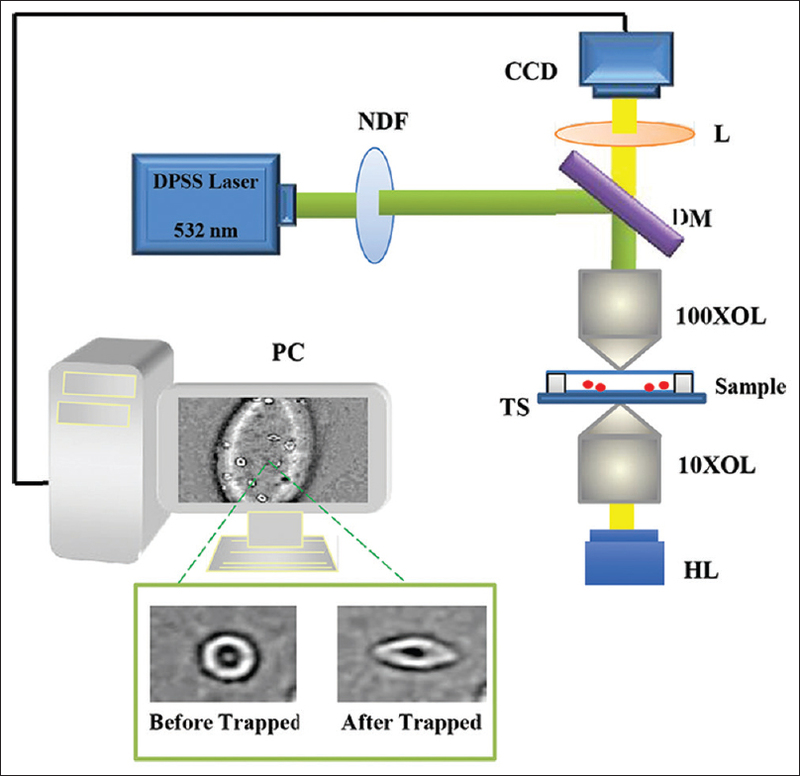 Optical characterization of red blood cells from individuals with sickle cell trait and disease in Tanzania using quantitative phase imaging. Sci Rep 2016;6:31698.